On the surface, Lofty Pursuits in Tallahassee, Fla., looks like a soda fountain and ice cream shop, but its recent successes have pushed its candy brand, Public Displays of Confection, into the public eye. However, the business has roots in a rather unlikely hobby: juggling. We spoke with owner Greg Cohen to learn about how Lofty Pursuits has evolved over the years and how some pieces of the past have kept the business moving forward. 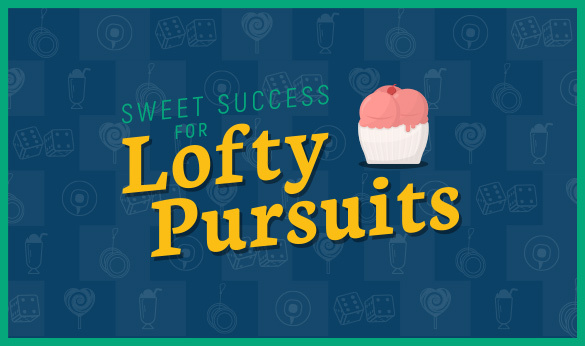 While most foodservice businesses have roots with chefs or restaurateurs who long dreamed of serving their food to the masses, Lofty Pursuits’ beginning is a bit more niche. While the bulk of Lofty Pursuits’ business is now food products, evidence of these fun origins are still evident in the seating area of the soda fountain, where toys and games are available both to play with and for sale. While Cohen enjoyed this line of work, he soon found the rise of an internet superpower encroaching on his retail sales. Thankfully, his business philosophy meant he caught this change in tides early. After closing down the mail-order side of the business, Cohen was left trying to figure out how to keep his business solvent. At this point, Lofty Pursuits had toys and treats, but Cohen wanted a spectacle to draw even more people, and he happened across the perfect solution. Candy build of the day. Banana. Now that Lofty Pursuits had a soda fountain and candymaking, there was a new location on the horizon. In January 2017, Cohen moved his business into a new, larger location, and began working toward offering brunch, which has recently become available. With Cohen juggling all these concepts in one business – did we mention Lofty Pursuits also operates an ice cream truck and does catering? – it would be easy to let the quality slip. However, an intense focus on high-quality ingredients and service has kept Lofty Pursuits at the top of its game. When Cohen added a brunch menu in recent months, he kept to his creed of using the best of the best, but stayed closer to home. Another part of that dedication to quality is using the same tools for candymaking that were used by the masters of the art in the Victorian era. From there, Cohen’s antique findings snowballed. Sometimes some of those antique finds came from some pretty unexpected places, such as the piece of equipment found in an automotive garage. It spent years sitting on a shelf in the garage simply because the owner liked how it looked. Keep an eye out for the second part of our interview with Greg Cohen, where we discuss his thoughts on social media, marketing, and his popular candymaking videos.